Could you advise me whether it is possible, or indeed advisable, to clean seal-marks? I am concerned that the cleaning of tarnished gold may harm either the seal script or the surroundings. However when I see museum exhibits these marks are always pristine, so there must be a method. And what about gilt as used on colored surfaces; it fades to a dirty and very fragile brown. Any remedy for this one? I am on deep water here since you did not submitted a picture, but this sounds a bit dangerous. To give a general technical background I think we could look at enamels - or the gold used on rims and in decoration - as similar to ordinary window glass but powdered and mixed with gold powder or metallic oxides to give it color. This is then applied to the hard and already fully fired porcelain glaze, mixed with one of several possibly mediums, similar to ordinary paint. Then heat is applied to make this "paint" melt and form a colored glass drop, or a colored surface, stuck to the porcelain glaze. If everything goes well this is it and you have a nice and clear "enamel" on the porcelain surface. This should then be as permanent as indeed a drop of melted glass. No discoloration, no problems. If this process was successful the only discoloration possibly would be ordinary dirt and this could be removed with whatever removes dirt. The first try should be with water and possibly some soap. If this does not work - this is a warning sign and any further actions might cause permanent damages. During the enameling process there was always the possibility for some air to leak into the small furnace used for applying secondary enamels. If this happened the enamels could be damaged by the oxygen in the air. 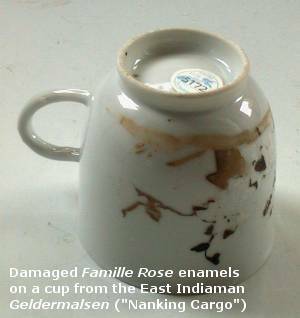 It is also likely that enamels could have been fired for too long or too short periods too, also making the enamels technically damaged. My point is, this is what it sounds to me, has happened with the enamels you are describing. If this is the case the best route must be to leave them exactly as they are, or face the risk your cleaning will remove something which will not be possibly to replace. There is a final possibility I hesitate to mention - but it is there. During the excavation of the foundered East Indiaman Gotheborg (from which my site has its name) millions of Chinese porcelain shards were found. Some of them had been exposed to salt water for some 250 years and mostly only had traces of blackened and damaged enamels left of the decoration. To see if we could bring back the original colors an experiment was made to re-fire them in a modern electric pottery oven. In some measure this was successful and the enamels did appear again, but thinner then the originals, since some of the enamels actually had been lost over the years in the water and still worse - for some reason - with not exactly the correct original shades of the colors. I would advice strictly against this method as a way of restoring enamels on an antique collector's items. Unfortunately this is as far as I can come on this. Oh yes, just came to think of it. In the Gotheborg discussion list the subject of “cleaning porcelain” came up a while ago. Somebody had with some success experimented with dental bleach tablets. If the stains are somewhere between dirt and technically damaged glaze this just might be worth a try.